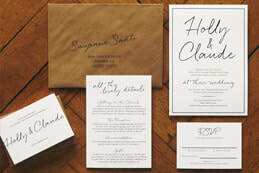 "The invites, place names, table names and table plan were amazing. Great quality textured card and amazing print quality really set these apart from the rest. Ger got in touch straight away and worked hard to get us exactly what we wanted. Would definitely recommend. 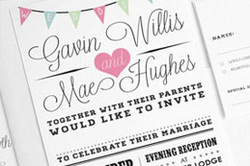 "Thanks Ger for the wonderful invitations - we are really pleased with the quality and design (and the fast delivery). Your quick responses to all our communications and friendly customer service made us feel calm in the midst of all the crazy wedding planning. Much appreciated. Great job - very professional. Highly recommend." "A huge thanks for our invites! They've arrived safe and sound. Looking forward to send them all out this time next month!! I will let you know if there's anything else we need, but thanks again for all you hard work and persistence. I think they're beautiful." "I just got them this morning!! :) They are so stunning! Love them. Really, you did a great job, just wanted to let you know. 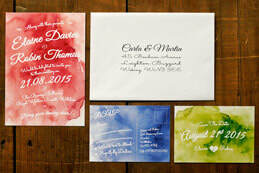 "I just want you to know that we absolutely love the invitations. They're even nicer in person than we were expecting. I will definitely be passing on your name/business to my friends who are looking for high quality, reasonably priced, absolutely beautiful invites/save the dates/etc. Your flexibility, availability, and customer service was astounding. "I will pass on to friends as your service has been great and have enjoyed working with you to get these ready, quality of invitations and price are also great. Thanks again for the great service and great product." 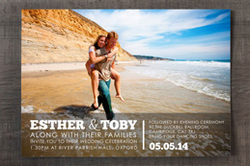 "we have received our invitations and we are so happy with them! Thank you so much, your service was actually the best I have ever received and it is so appreciated. So thank you once again, we will highly recommend you to our friends and family - and look forward to working with you agin in the future maybe!" "I was reluctant to order my cards online as the service I'd receive when looking around had been patchy (delays in responding to emails/not picking up the phone). I have been mightily impressed with how quickly the sample came/responses on questions from you/turnaround of draft and I shall have no hesitation in recommending Feelgood: product and service are ace. " "What a WONDERFUL surprise to get the announcements in the mail today!! They are beautiful and the kids loved them. Thank you for your time, patience, expertise and beautiful work. 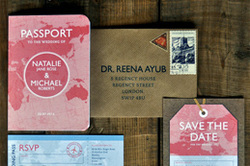 "Brilliant service and top quality invites. I couldn't be happier with the end product, thank you so much for making it so easy. Highly recommend." "Hi Ger! Sorry I haven't been in touch before now, been super busy! Just wanted to let you know that I received the invites and they are absolutely perfect! Exactly what I was looking for! They're all out now and I've had so many compliments about them! 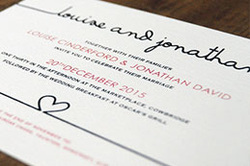 "Just want to say a massive thank you to Ger for our beautiful wedding invitations! They have arrived and are absolutely perfect! We will 100% recommend you to all our newly engaged friends! Your service was excellent with quick responses and quick delivery! We will be in contact if we need anything designing for our big day!" "We received the invites earlier this week, and just posted them all off this morning! They look lovely — we'll definitely be in touch closer to our wedding's date once we've sorted out stuff like menus, orders of service etc. I'm sure all our friends and family will be just as impressed with the designs as we have been, so we'll definitely refer you along when people comment! Thanks again, and we look forward to doing business with you again also haha!" "Just wanted to let you know how much we love our invites! Will send pix after the wedding. "The service we received was fantastic. Ger was prompt at replying all emails and open to all suggestions and changes. His idea was to really work with what you want and he changed the designs as per our discussions and ideas as many times as required until we we satisfied with our dream wedding invitations. The final product exceeded expectations and everything was received within the time frame mentioned! Extremely good product and service, cannot recommend enough!" "Thank you for the wonderful invitations! We are thrilled with them. Great colours. And so quick! We will definitely be recommending you to friends." 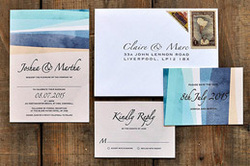 "Thanks for the excellent service, you are always prompt and attention to detail is excellent, we will be in touch shortly for the on the day stuff, and we have already mentioned you to our friend who has/will be in touch about her invites." 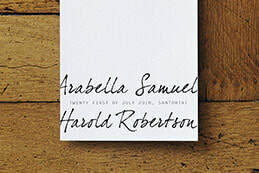 "My husband and I were both thrilled with our Penguin Classic-style wedding invitations suite (very appropriate for the marriage of an English teacher and a book-lover!). The service we received was brilliant, with no little tweak being too much trouble. The invitations looked beautiful and felt gorgeous too and they were dispatched really quickly. So many of our guests were full of admiration for the invitations in their RSVPs. I have already started recommending Feel Good to all newly-engaged friends. Thanks so much for making this detail of our wedding so special :)"
"One of the reasons why we chose Feel Good Invites is because of your unique style and quality which stood out from the rest, and it was so easy for us to finalise what we wanted. 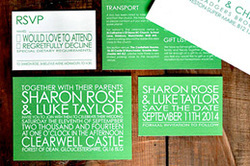 For sure, you will be our go-to guy for prints, cards and invitations from here onwards. We sincerely hope your business will continue to grow in leaps and bounds, and we will surely pass on the good word around to everyone we know. Plus, they will surely know what we mean when they get their invites soon!" "I hope you had a lovely christmas and are enjoying a well earned break. I just wanted to say that the invitations have arrived and they are gorgeous. They are beyond lovely - thank you so much for all your help and time in creating them with us. They really are something special. Thank you so much from the both of us. Have a lovely New Year!" Thanks ever so much for all your help and can I just say that out of all the suppliers we have been working with you have given us the best service by far, it has been outstanding. I wouldn’t hesitate in recommending you, you clearly put your customer’s first and I have enjoyed dealing with you. 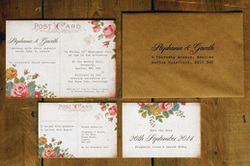 "Thank you so much for our fantastic wedding stationery! We loved how you modified the designs to suit us, and always helped us with what would look best whilst also listening to exactly what we were thinking. 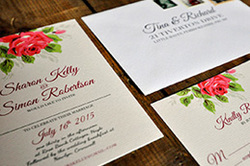 The service has been top notch with quick responses, quick delivery and wonderful quality stationery. Would highly recommend to anyone looking for a highly professional, helpful service"
I meant to get in touch earlier to say the Save the Dates look fab. Thank you. I have passed on your details to my friend, Kate as she is getting married in July next year. I will be in touch about the invites shortly. " Just to let you know the invites arrived yesterday and they are fantastic, my fiancée is really pleased- thanks for the brownie points!!! Our order arrived today and we're absolutely over the moon!! They are such fabulous quality and exactly what we wanted. We can't thank you enough. Will get our photographer to take some pictures and I'll forward them to you. "What can I say? We are absolutely over the moon with the invitations. They are a million times better than we could have hoped. Thank you for your help, patience and advice. We'll definitely be recommending you and using you again in the future. Thank you SO much, the invites arrived yesterday. Extremely quick service indeed. They are exactly what we wanted, thank you. I will keep you in mind for any other related projects. A friend is hoping to get engaged this Xmas so I will be passing on your details. Have a fab week and speak soon. "thanks again for everything I will indeed recommend you, you have genuinely been so fantastic and I am so glad we came across your company, we couldn't have done it without you! I received the invitations yesterday. They look great! I love them. They are so organic and the look and feel suits our wedding perfectly. I will send a photo once I get them ready to mail out. "I just wanted to let you know that the invites etc were received last week and they have now been sent out! Bye for now and huge thanks again." Just wanted to say thank you for the invitations, they are beautiful. We have sent them and have received many compliments over them." We received the invitations on wednesday and they are ABSOLUTELY BEAUTIFUL!!!! Couldn't be happier, thank you so much!!! 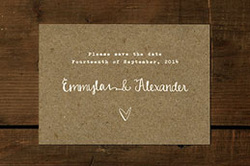 I have to tell you, the Save the Dates you created for us were absolutely beautiful. I have received compliments from everyone that got one. Simple stunning!!! Thank you. Now, onto the invitations." "Absolutely delighted with my invites. I asked for a goldfinch on them and Ger did it perfectly. Can't thank you enough. 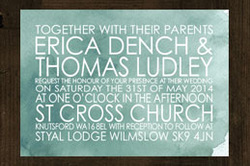 The invites are beautifully made, good quality and everyone has commented how lovely they are. 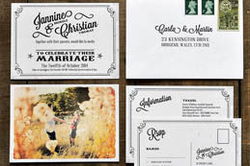 Highly recommended"
We just wanted to say thank you very much for our wedding invites. They arrived promptly last week and we are very happy with the quality of the print and the card. We are sending them out this week so will let you know if we have any extra feedback from the guests. And we will definitely recommend your website to our engaged friends! Our Save the Date Cards arrived and they are just gorgeous! 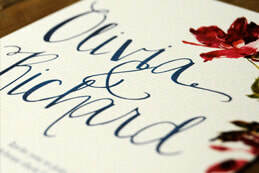 Will be in touch soon to order the invitations. Invites arrived and we are delighted with them thank you so very much! I even want to frame one! The orders of service have arrived this morning, so promptly. Thank you. 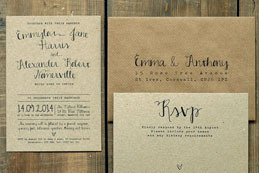 We have been so pleased choosing Feel Good Invites for our wedding stationary. You have been so efficient & we are delighted with the invites, the orders of service & table eye spy's, & can't wait to show them off! 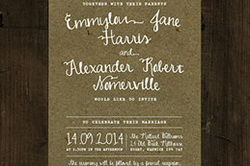 "Just letting you know the invites arrived safe and sound and are fantastic! Thankyou so much for your assistance through the process. "We have got the invitations and their amazing both me and my fiancé love them. Thank you for all of your hard work and effort in putting them together and making the whole process so easy. "Hello, I received my invitations today. Thank you so much for your excellent service. They look and feel amazing. Would certainly use your services again and recommend to friends and family. " Just to let you know we received the invites yesterday. They are prefect, we are really pleased with them. 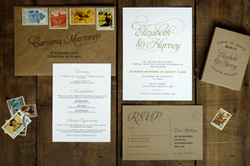 "Invitations and envelopes arrived today. Wow how fantastic! Thank you for such brilliant service and awesome products. Can't wait to hand these out. I just wanted to thank you for our wedding stationary they arrived a few days ago & look amazing :o) Thank you for your patience. I will make sure i get sharing to try & drum up some business!! Thanks again, i will definately be in touch should we need anything else." So sorry for not emailing you sooner to say.... THANK YOU SO MUCH!!!!! Our invites arrived and they are absolutely beautiful!!!!! Thank you so much for all your help and I will make sure I recommend you to all my friends! 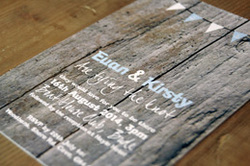 "The invites came this week and they look stunning, we are so pleased with them! Thank you so much for all your help! I actually know a lot of people getting married this year and I will send them a link to your site. If you would like to leave feedback on any websites, let me know, I would be happy to do that." "GORGEOUS! We love them. Thank you! Fi x"
"Ger produced our wedding invites for us.... After shopping around (lots) we found the designs of feel good invites our favourite. From the word go the communication was excellent, the proofs came very quickly. 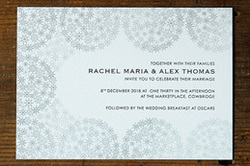 We have just received our invites and they are beautiful. The paper quality is excellent, and if possible even better than the picture online!! Would and will highly recommend these guys to anyone. 5 Stars from us." Sorry it's taken me a while to email. The invites arrived and look lovely. 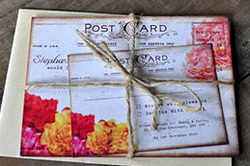 They have been posted in grey envelopes and look so simple and stylish, just what I was after. I am so pleased with them. Thank you very much. "And have already been raving about you to anyone who will listen!Thanks so much again for all your attention to detail, design improvements and absolute accommodation of my tiny changes!" We got our invitations today!! We are so happy with them. Thank you for doing them for us, especially for fitting us in when you were so busy :)"
"A massive thank you Ger for our fantastic Day and Evening Invitations!! 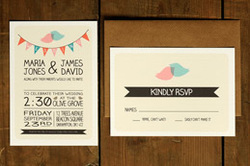 The quality of the invites are excellent, service was brilliant and delivery was very fast! We were in constant communication with Ger until we were 100% happy with them. Couldn't fault the customer service. 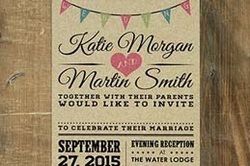 We recently posted our invitations out and had great response from our family and friends. I highly recommend this company for their brilliant service. Thanks again!" "What a fantastic experience! 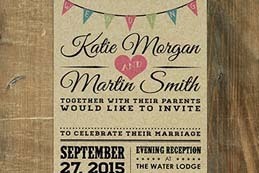 I ordered the vintage bunting kraft wedding invitation suite including day and evening invites, table names and table plan cards. I have been absolutely delighted with the service to date- have just received the invites and will be finalising design for table names and table plan once our RSVPs are through. Feel Good Invites have been excellent throughout- reliable and quick responses, letting me play about with layout and colours to ensure we got exactly what we wanted. 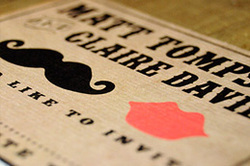 I would not hesitate in recommending Feel Good Invites at the drop of a hat and I am so pleased with these high quality invitations. Thank you Ger and Sarah!" "All the invites have been sent and had some really awesome responses from our guests and family. All the bespoke detailing worked out really well and thanks for your patience throughout the design and printing stages. The delivery was much quicker than expected leaving us much more time to organise and write them all out. The quality of the invites speak for themselves and was still a very pleasant surprise seeing them in the 'flesh' rather than PDF. It was like Christmas opening the box and seeing the results of hard work. Its a great start to our big day and has really set the tone. I will be sure to spread the word to friends!!!" 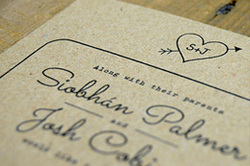 "We have received and sent off our wedding invitations from you and we are so pleased with them. Lots of people have even said they are the best invites they've ever had! Yay! The quality is wonderful. Thank you so much."